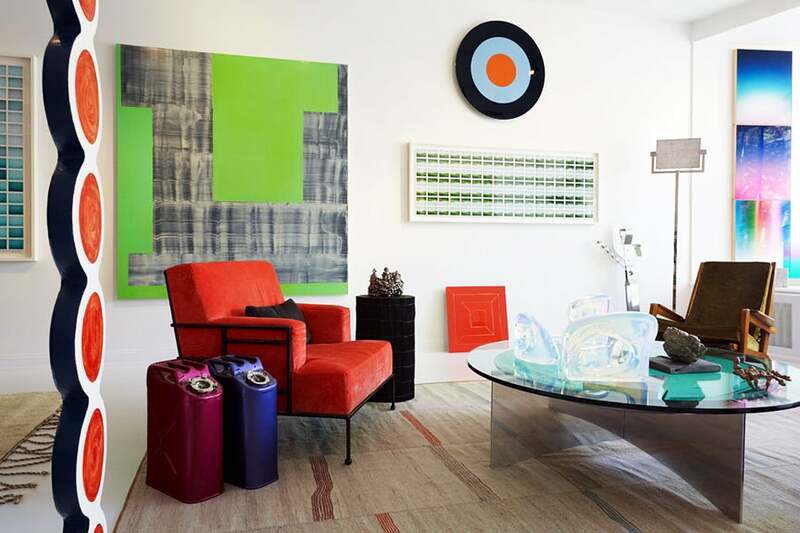 To that end, Stilin has curated an exhibition at East Hampton’s Eric Firestone Gallery that mixes art, furniture and objects in room-like vignettes. The show, which will be on view from May 25 through June 10, features new work by Eric Cahan, Gregory Johnston and John Messinger, all of whom have shown with Firestone before, alongside a broad selection of 20th- and 21st-century objects, furniture and sculptural pieces culled from, among other sources, Firestone’s inventory and Stilin’s eponymous shop nearby. “I installed the art in the gallery as though it were a client’s home,” says Stilin, who’s known for creating casually luxurious environments in which modernist gems like a 1940s leather Eero Saarinen chair share space with a plump-cushioned, linen-upholstered sofa. 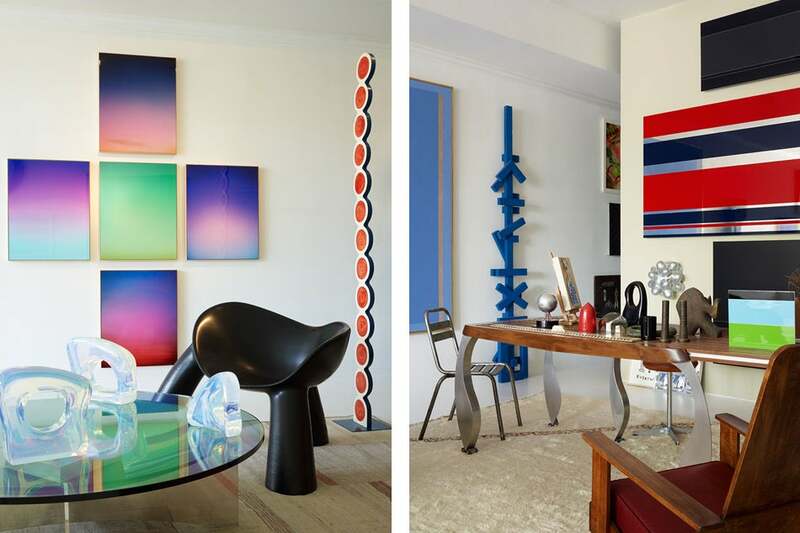 Works from Eric Cahan’s 2013 “Sunrise” series hang above a 1950s credenza by Carlo Hauner and Martin Eisler for Forma, Brazil, with I Just Found Out I?m Not the Man I Wanted to Be, 1970, by Jorge Fick to the right. The 1960s table is by Phillip Lloyd Powell and Paul Evans. 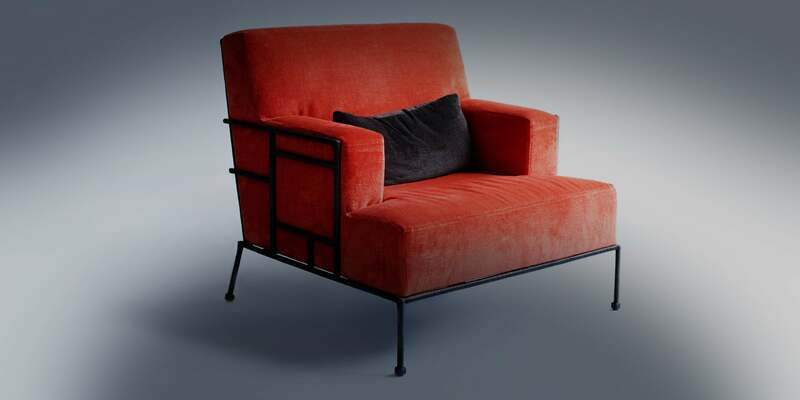 Stilin himself designed the brown cashmere sofa. 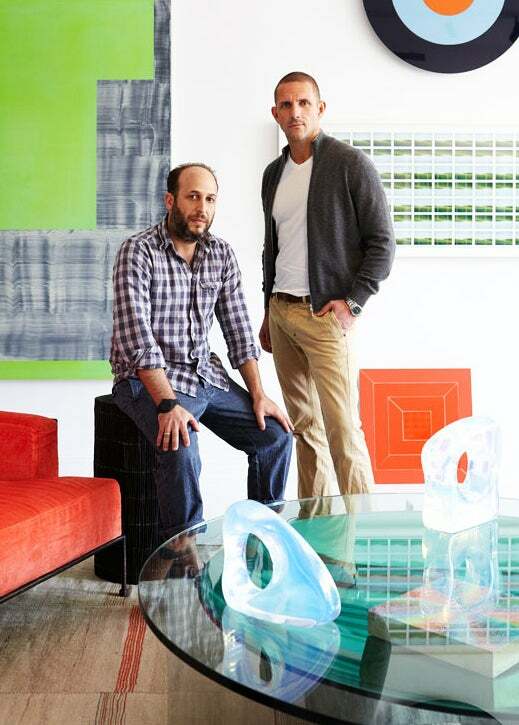 Left: Lucite pieces by Mia Fonssagrives-Solow, all 2012, sit atop a French 1960s glass-top coffee table with an aluminum base that faces a 2011 chair by Wendell Castle. Works from Eric Cahan?s ?Sunset? series hang in the background. Right: Ron Arad designed the walnut-and-steel table, 1986, while the red-silver-and-blue painting Monaco, 2013, is by Gregory Johnston. The silver wall sculpture below it, Meteor Crest, 2006, is by Christopher Hart Chambers and the Blue Tower sculpture, 1960, Sidney Geist. Mattia Bonetti designed both the red Pliniana arm chair, 2013, and the Bundle of Sticks table, 2013, beside it. The contemporary gas canisters and the target, red square and lime-green paintings are all by Gregory Johnston. Left: In this vignette, All That’s Left Is You, 2013, by John Messinger, hangs above a bench, ca. 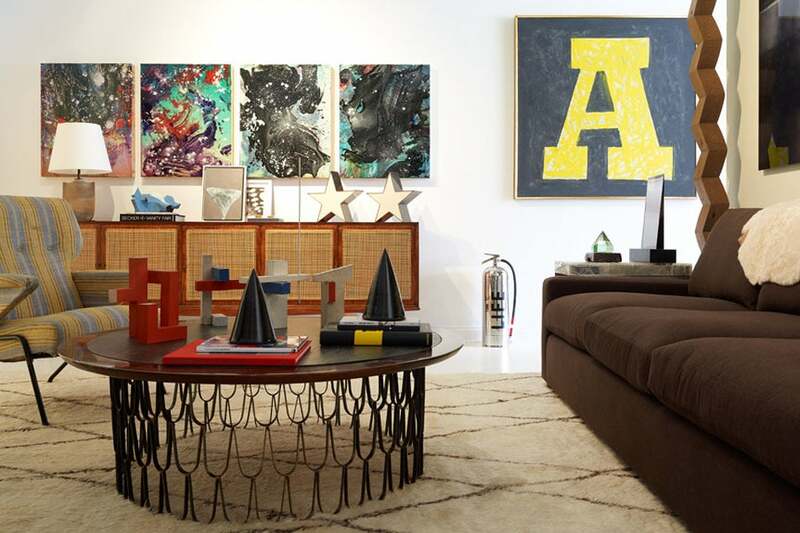 1970, in leather, aluminum and steel by Max Gottschalk, with two untited works from 1976 by Sidney Geist off to the right. The oak chair, ca. 1953, is by Pierre Guariche and the French 20th-century pine stool is one of a pair. Right: John Messinger’s Stuffed With The Stuff That Is Fine, 2013, at left, and a wooden sculpture called Sentinel, 1964, by Sidney Geist, flank a 20th-century French metal chair from a set of eight. Inside Firestone’s gallery stand three vignettes, each with a different sensibility. 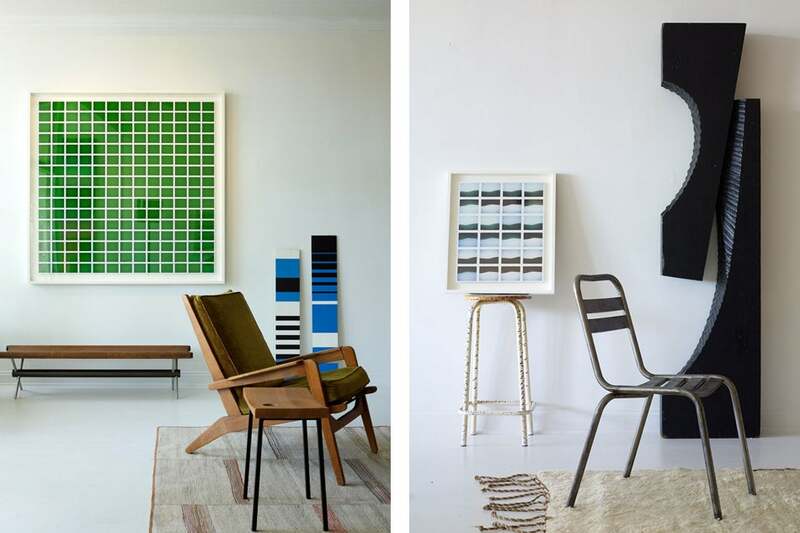 One is minimal and monochromatic, with a vintage French flea-market chair, an abstract sculpture by Sidney Geist and a framed grid of photographs by John Messinger resting on a studio stool that was found in the gallery basement. 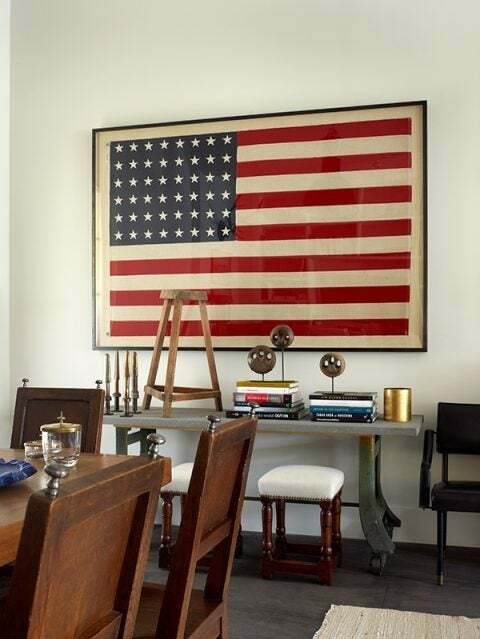 The featured artworks, never deployed as decorative accents or overshadowed by the environment, very much hold their own. “Gregory Johnston’s paintings are quite design-oriented and installation-driven,” says Firestone of the sleek stripes and mirror-like finishes of Johnston’s canvasses, a selection of which hang behind a massive Ron Arad table arrayed with a variety of small sculptural pieces. A group of Eric Cahan’s “Sky Series” photographs, meanwhile, can be viewed from the curved embrace of a Wendell Castle chair, which faces a French 1960s glass-topped coffee table. 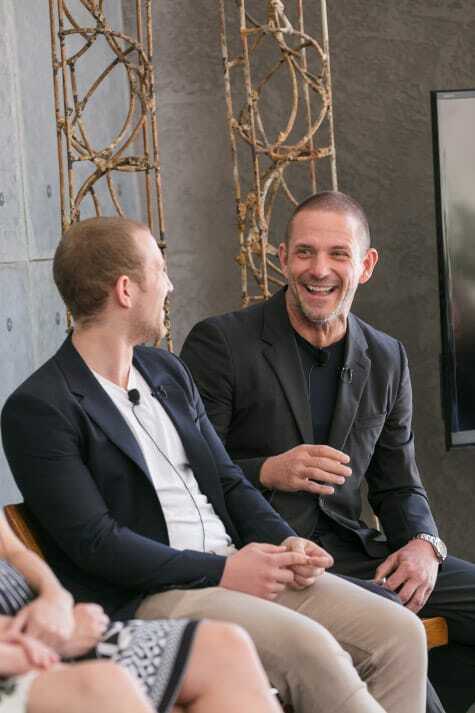 We chatted with two established designers and their emerging-talent offspring to find out what it's like to grow up in the interiors business and what it's like to finally work as colleagues.